A Smart Home is a house, condominium, or apartment that has devices for controlling security, lighting, temperature and humidity, irrigation, multi-media, surveillance, and many other functions. In a Smart Home the devices can be controlled remotely by smartphones, computers, and tablets. And programs automate the function of the devices around your home for you. With them comes the promise to make your home safer, more comfortable, and more convenient to manage. But the path from selecting the products you want to having a complete working system is daunting. Sorting your way through the ever increasing number of products and making sense of which ones work together is overwhelming. That's where EZ-Integration comes in. Our trained professionals will sit down with you to discuss the possibilities and design a system that provides what you want to get out of your smart home. We take care of the rest. You get the awe inspiring benefits of a smart home without all the hassels. It's Smart made simple. Imagine your house coming to life. Anticipating when you need lighting and when you don't, keeping the temperature in the house comfortable all year round, and protecting it when you're away. Now picture it all being controlled by one system that makes it as easy as 1-2-3. You will feel even more like the king or queen of your castle. That's the power of home automation from EZ-Integration. There are many benefits you will experience with a well designed smart home system. Our systems are flexible and feature rich, providing the right solution to fit your needs. We'll design a system with the features you want, not a bunch of extras you don't. 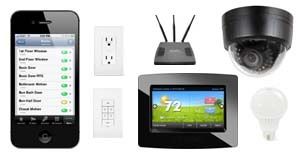 We have the products and knowledge to make controlling your home a cinch.